If you’ve spent much time ice fishing, the chances are that you’ve encountered the frustrating situation of sorting through small fish for keepers. Sometimes the solution is as simple as an area or presentation change. Other times it is just a matter of catching every bite to see what is on the end of the line. Typically there is a big school below when this happens. They are often aggressive and stick around in the area, giving you the opportunity to set up camp and fire up the heater, it can be a lot of fun. This is one of the absolute best situations to drop an underwater camera down and make it even more fun. No longer are you wasting time setting the hook on the small ones. I’ll keep the school interested until a fish I want is ready to bite. Then it’s just a matter of playing keep away from the others until that fish makes a mistake. You’ll be amazed at how much time you are spending catching the right ones instead of taking little ones off the hook all day. Upsizing your presentation can help make a difference. However, I’ve seen it many times where a small presentation that can be eaten by both big and small fish is the deal. Especially if the area is experiencing a lot of pressure. Which unless you are on a private lake, that is often the case. You’ll also find it helps with catching a surprise species once in a while. I find it much easier to trick a big predator species like bass or pike into biting while targeting panfish if I know it’s a bass or pike staring down my bait. 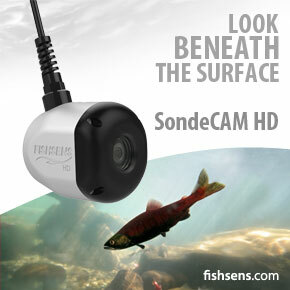 You certainly won’t miss anything that is going on down there when using a SondeCAM underwater camera. It’s amazing what you’ll learn about what is happening below the ice and it certainly will help you catch the biggest fish in the school.